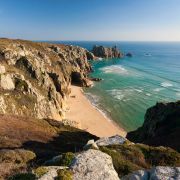 The stretch of coast around Porthcurno cove is particularly dramatic (and no, that isn't a reference to the Minack Theatre!). It is also home to any number of ghostly legends of and strange tales. One of the most enduring of these legends is that of the phantom ship. 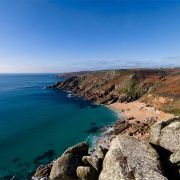 It is said that as the evening mist draws in over the sea at Porthcurno a ghostly, four-masted sailing ship would sail in to the bay. 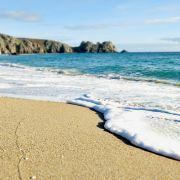 The dark spectral form would not stop at the sand but continue up the beach and inland as far as St Levan whence it would disappear within sight of the church. No crew would ever be witnessed, not even rowing the small boat which sometimes followed. For those who saw the ghost ship misfortune was said to follow. These ghostly happenings were believed to be associated with a sinister man who lived in the village many, many years ago. Always followed by his equally sinister and strange servant nobody knew who they were or ever talked to the pair. Everyday the two men would row their small boat far out to sea, only returning as night fell. 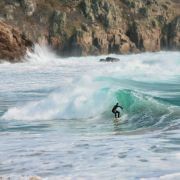 This they did regardless of the mighty storms and high waves which often crash into Porthcurno cove. When not sailing, the two men would often go hunting with an unseen pack of hounds. After many years the man died and was taken to St Levan church for burial. The coffin was placed in the grave but the moment the priest spoke and the first earth was thrown on to the coffin the servant vanished into thin air accompanied by the sound of a pack of dogs. 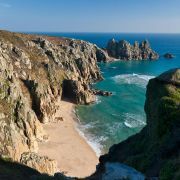 From that day on no boat has ever been kept in Porthcurno Cove. 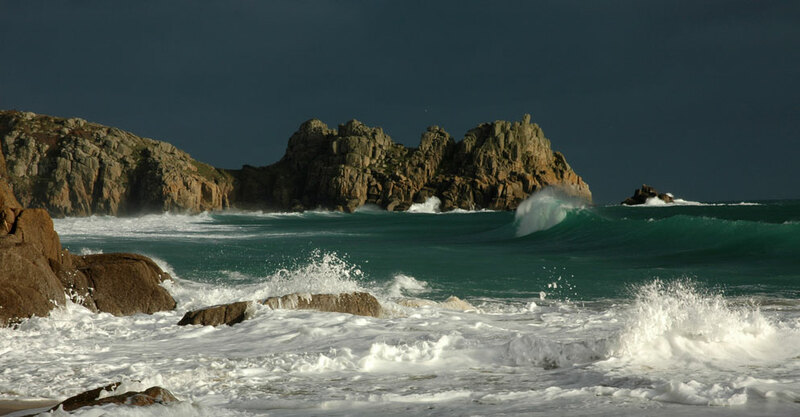 Porthcurno Cove was once a favourite haunt of witches. They would gather on the high cliffs of Treen near the Logan Rock and brew their dastardly potions. The coven is said to have travelled on the stems of the ragwort plant and been lead by the most notorious of the bunch, Madgy Figgy. 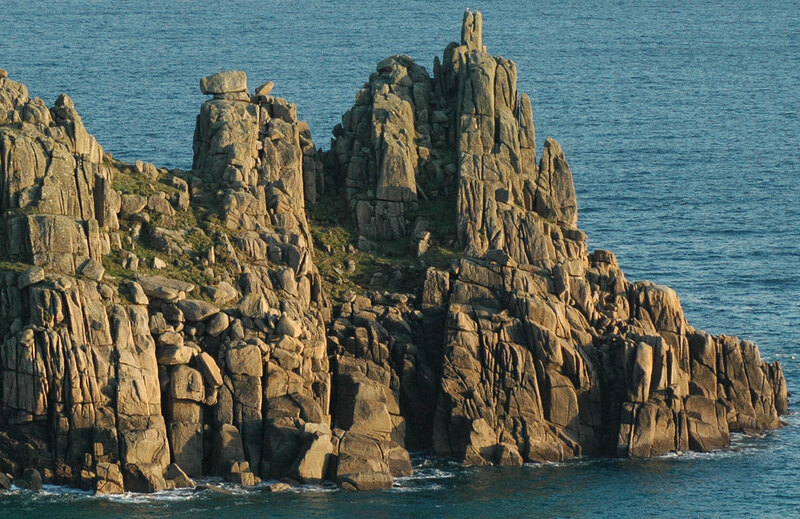 Madgy Figgy's was often to be found perched on the rocks between Porthcurno and Land's End at Gwennap Head, or Tol-Pedn-Pennwydh to give its Cornish name. Here, from Madgy Figgy's Chair the witch could look out over the ships navigating the treacherous waters around the Runnel Stone. But Madgy Figgy and her coven were not just observers. When the wind blew hard her and her fellow witches could be seen working furiously at their cauldrons brewing up mighty storms to drive the ships ashore and drown all those on board. On one such occasion a Portuguese trader was lured into the cove and smashed onto the rocks. As the bodies washed up Madgy Figgy and her coven of witches stripped them of their valuables of which there were many. However, there was one body with more gold than any other which Madgy Figgy told all the witches and wreckers to leave well alone for it had a mark upon it. After much argument all the jewellery of the woman was placed in a chest which was locked and placed in Madgy Figgy's hut. The following three nights a light rose from the grave of the woman and made its way to Madgy Figgy's Chair and then on to her hut were it hovered above the chest. On the final night a strange man visited Madgy Figgy's hut. Speaking only in signs he asked to be taken to the grave of the woman. As before, the light rose and lead the way to the chest of her belongings. The man took all of the jewellery and belongings and was never seen again. Afterwards Madgy Figgy explained that the dead woman had also been a witch. Anyone who had stolen her belongings would have themselves died. The headland on which the Logan Rock sits is known as Treryn Dinas or Treen Castle. It was home to an Iron Age cliff fort the outline of which can still be seen today. Legend sates that this headland was once the home of a mighty giant and his beautiful young giantess wife. Here they spent their time sitting in their huge rock chairs – the Giant's Chair and the Giant Lady's Chair. It seems a neighbouring (and younger, more handsome) giant, took a fancy to the good giant's wife and it apparently she took a fancy back. One day when the giant and his wife were dosing in their respective chairs the wicked young giant crept up behind stabbed the other giant in the belly. 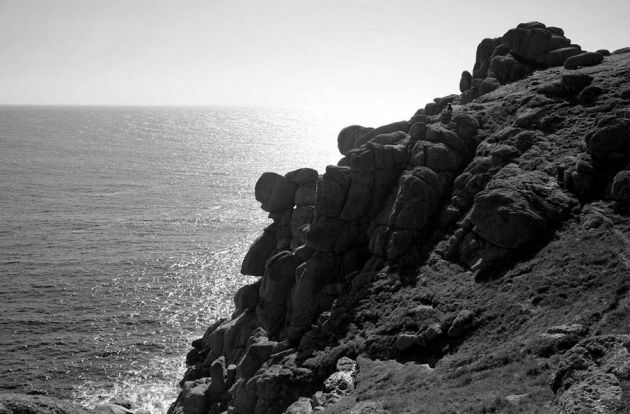 The old giant fell from the cliffs and died as his life blood flowed in the sea far below. Free from the old giant the two evil lovers took possession of Treryn Castle and lived happily ever after – which makes a refreshing departure from the usual legends were justice is always restored! 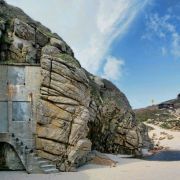 Somewhere in the cliffs of Treen is a hole known as the Giant's Lock. It is said that the old giant placed a magic key in this lock and if it were ever to be removed Treryn Castle and all upon it would disappear under the sea for ever.